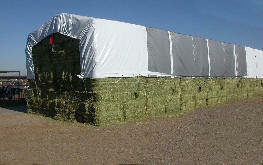 Hay tarps and covers are a cost effective alternative to permanent structures. By covering hay you can reduce hay loss to weather related damage, minimize bacteria growth, and retain nutritional value. Tarped hay has a higher market value, in some instances up to $30 more per ton compared to untarped hay. Western Ag Enterprises, Inc. is the United States largest manufacture of Hay Tarps. We have standard size covers, and we can also make custom size covers depending on stack configuration. 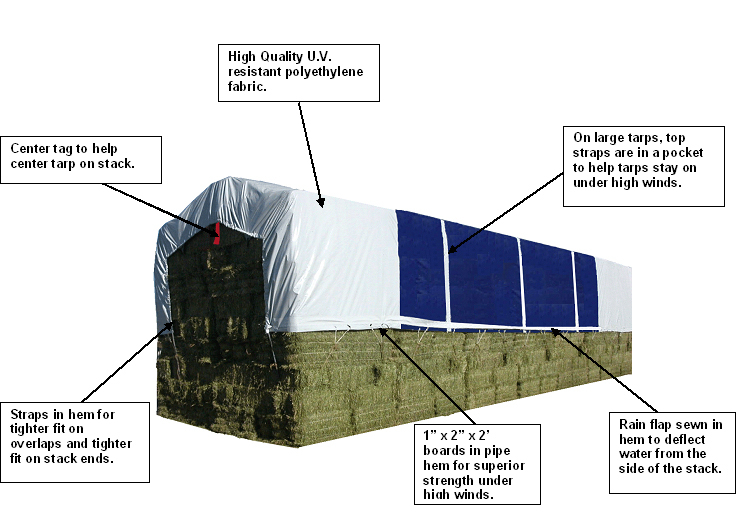 Hay tarps are designed specifically for covering hay stacks and are completely assembled, including rope, and are folded for ease of installation. Constructed of a high quality U.V. resistant polyethylene fabric. 2" x 2" x 2' boards spaced in the hem with rope attached to secure tarp. Draw straps in hem to secure end on tarp down. Rain flap to deflect water away from the stack. Top straps are standard on large tarps for superior strength under high winds. Optional buckle assembly is available to secure the tarp to the stack. 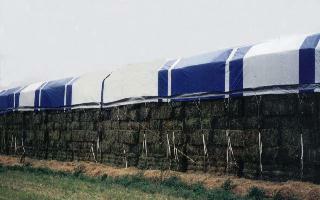 With proper care hay tarps should last 3 to 5 years and are covered by a 3 year U.V. warranty. Our UV treated fabric is available in weights of 6.3 oz (P- 86) or 7.3 oz (P-212) per square yard.